Notes: The Spotted Scorpionfish also called Gurnard, Pacific Spotted Scorpionfish, Prickly Hind, and Stinging Grouper. To be successful with the Spotted Scorpion You will need at least a 70 gallon aquarium with plenty of live rock. 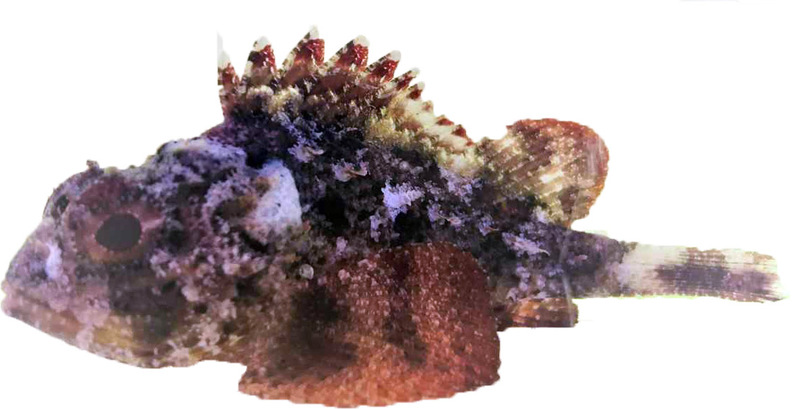 Spotted Scorpionfish are generally safe in reef aquariums as they do not eat corals or polyps, but take extra care to know where the fish is located as they may blend in very well with the rocks and corals. Do not keep these fish with shrimp, crabs or fish small enough to be eaten. These fish are voracious predators. Most species will wait for potential prey to come close before snatching it for a meal. Scorpionfish can be fed a variety of frozen and prepared meaty foods like shrimp, clams, scallops, krill and other similar foods, but some may need live food like small feeder fish or ghost shrimp to trigger a feeding response. Those that dwell in rock or on the bottom of the aquarium may need to be target fed with tongs or a feeding stick to make sure they get adequate amounts of food. Scorpionfish are perhaps best known for the venomous spines in their dorsal and pectoral fins. The sharp spines are used by the fish to ward off predators. While special consideration should be given before placing one of these predators in your home aquarium, they are some of the most stunning and desired fish in the aquarium trade. Fish in this family vary greatly in appearance, even between individuals of the same species. Due to variations within species, your item may not look identical to the image provided.